Who Doesn't Want a VW Camper Cooler for Christmas? This has to be one of the grooviest coolers I've ever seen! It looks just like a retro red VW camper van. ​You can use in either indoors or out and the lid flips open to make it easy to get at the good stuff you've filled it with. ​It measures 33Lx15Wx18H and weighs in at 28 lbs. ​It's a bit expensive but then, the best Christmas gifts always are and it is something that your favorite old hippie or retro VW van lover will cherish forever. Give me comfort or give me... well, I don't want to go as far as to say give me death but I certainly do love me a great pair of well-worn blue jeans and a comfy t-shirt. In fact, that's my costume nearly every day. And I truly love when my tees have fun retro images on them. That's why I'm starting this series of blog posts that will all feature some truly awesome and awe-inspiring modern retro t-shirts. 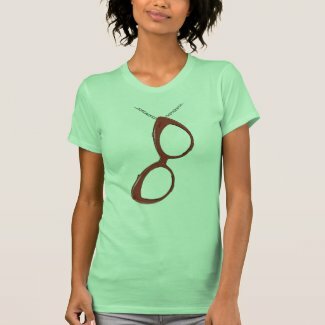 ​Today's hip find is a fun shirt with a huge pair of cat eye glasses dangling on the front of it. Just to be clear, this is an image of a pair of retro-look lenses, not actual eyewear. The design is super cute just the same. Cherry red Rockabilly cat-eye glasses look like they're hanging from a delicate chain. Shown here on a women's lime green American Apparel fine Jersey shirt, this design is also available in just about every style, color and size you can think of. Visit HERE to customize one that's perfect for you today. Cat eye glasses were originally popular in the 1950's and 60's. Much like an actual cat's eye, the outer edge of the eyeglasses swept upwards on an angle. Chances are, if you picture a woman wearing a beehive hairdo, she's wearing these classic specs. This shirt would be cool to wear at a 50's or 60's theme party too. Not invited to one? Throw your own. Get your custom invites here! Click to learn more or to order this Mickey Mouse shirt. Just out of curiosity, and to keep myself from doing something more important, I typed the word "retro" into the search bar at Zazzle.com. Zazzle is the site we're affiliated with that sells all of the awesome and unique invites and gift items that we're always talking about here on Retro Invites. I was pretty surprised when a Mickey Mouse t-shirt popped up. Of course it was the vintage style (my personal favorite) of Walt's famous mouse that is being sold by the Disney shop. But... I guess I just always thought of that design as something that would be considered "vintage" and not necessarily "retro". And even more surprising was that it wasn't just one Mickey shirt but a whole page of mostly old-fashioned style Mickey shirts and gift items. In order to better serve this blog and anyone who reads it, into the future, I'll be searching for and exploring​​ the subtle differences between retro and vintage design styles and try to describe the differences as best I can. ​The Mickey tee design shown above is being featured on a white womens shirt but you can customize for sizes and styles to suit everyone and I do mean everyone. They have 174 shirt styles with many to fit infants all the way up to large adults. After visiting the page, scroll down a bit and look to the side to see a link where you can see all of the styles. Raggedy Ann and her brother Andy have been treasured by young children for 100 years and counting. Her character was created by the author Johnny Gruelle when he wrote the book Raggedy Ann Stories for his daughter Marcella.​ The book was marketed along with the doll to great success and the rest, as they say, is history. Through the years, the red haired rag doll with the triangle nose and "candy" heart has been licensed and sold by several different toy companies as dolls, books, patterns, comics and short films. She's currently available via Aurora World Inc., Simon and Shuster and at her own Zazzle shop where you can purchase personalized and custom gift items, greeting cards, and apparel for your favorite little girls and boys. Here's a small sample of the custom and personalized Raggedy Ann and Andy gifts you'll find at the Raggedy Ann Zazzle Shop. Raggedy Ann and Andy dolls and books can be found online at Amazon.com. Looking for terrific retro style gift ideas for the vegetable gardener in your life? Shopping for someone who loves vintage images? As a home gardener and lover of all things retro and vintage-style, I nearly flipped when I came across these wonderful reproductions of vintage vegetable seed packet art at Zazzle.com. The images appear on all kinds of different giftable items so there's sure to be something interesting for every gardener on your list no matter how young or old they might be. In fact, I think they have so many neat choices that you're going to have trouble deciding on just which one to buy. Here's a few of my personal favorites to help you get started. Click to learn more about this fun vintage summer squash seed packet t-shirt. You'll find a huge selection of t-shirts featuring artwork taken from vintage seed packets in all of your favorite flavors including carrots, cabbage, radishes, summer squash (as shown) and more. The artwork on these really needs to be seen larger than what I can show you here. They're really gorgeous. Best of all, each design is available on your choice of dozens of shirt styles for men, women and children in sizes to fit everyone from infant through adults. If you know their shirt size, any gardener would be proud to wear one of these. Click to learn more about this seed packet mug with three different images on it. A mug featuring images of vintage seed packets is another great gift idea that would be appreciated by any gardener and it can be used year-round which is nice too. These make great gifts for holidays but can also be fun when given whenever. With more than 150 different images and several different styles to choose from including travel mugs, you're sure to find the one that's destined to be somebody's new favorite. Some of the mugs have several different images on them (like the one shown here) while others have just one picture or type of plant. Click to learn more about this apron featuring an image of a vintage vegetable seed packet. These fun aprons that feature images of vintage vegetable seed packets make an exceptional gift and can be used by either men or women while cooking, grilling, gardening, crafting or any other messy activity. Each design is available on your choice of 3 different colors including white, yellow and khaki. They come in standard and long versions and there's even one sized perfect for children. There's quite a few to choose from too. Click to learn more about this lovely vintage seed packet cutting board. Your favorite vegetable gardener or cook might also appreciate one of these custom cutting boards where they can beautifully prepare the fruits of their labor. Click to learn more about this cute custom cauliflower pillow. Click to learn more about this pretty water bottle. Or even a fun pillow for resting up between garden sessions or a reusable water bottle to help keep them hydrated while working out in the hot sun. 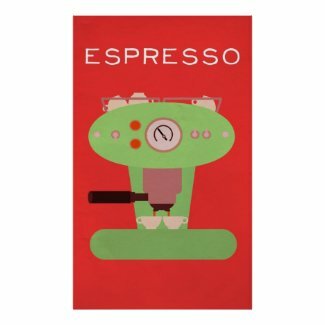 As you can see, Zazzle has tons of great retro gift ideas featuring the amazing artwork from vintage seed packets and there's a lot more items too including phone cases, magnets, poster prints and more. Visit Vintage Vegetable Seed Packet Gifts to see everything available right now.